A popular lakeside destination southwest of Fort Nelson, 12 km (7 mi) off the Alaska Highway 97. Encompassing 174 ha (430 ac), the recreation area offers 19 campsites situated in a spruce forest. A boat launch is provided to make your fishing more enjoyable. This park contains 312 ha (770 ac) on the east side of Charlie Lake, just 13 km (8 mi) north of Hwy 97 at Fort St. John. Featuring 37 lakeside campsites, a playround, picnic area, boat launch and sandy beach, Beatton Provincial Park is a great place to spend some time and fish for walleye and northern pike. Reservations are accepted. Located at Mile 173 (278 km) of the Alaska Highway, this 33 site provincial campground and park lies on 55 hectares (136 acres) along the Buckinghorse River. When stopping for the night, take some time to try your hand at fishing. The park area covers more than 19,000 hectares including Carp Lake, War Lake and numerous other lakes and streams making water activities the most popular pastime within the park. At McLeod Lake, 141 km (88mi) north of Prince George, turn off the John Hart Highway #97. It is 32 km (20 mi) to the Carp Lake Campground. Two campgrounds offer a total of 102 sites, as well as wilderness camping. Trails connect with Rainbow Lake, McLeod River and two of Carp Lakes beautiful sandy beaches. Nestled in the aspens on the southwest shore of Charlie Lake, the 92 ha (227 ac) park offers 58 campsites, picnic area, playground, sani-station, and boat launch. Walking and hiking trails lead through the forest. Fishing for walleye and northern pike is popular. 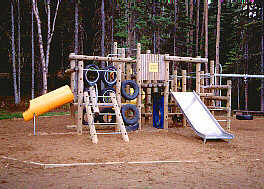 The park is located near the junction of Hwy 29 and Hwy 97 about 20 km (12 mi) north of Fort. St. John. Located almost half way between Tumbler Ridge and Chetwynd, Gwillim Lake Provincial Park is 9,199 ha (2,272) set in the foothills of the Rocky Mountains on Highway 29 South. Campers will enjoy the 49 forested sites overlooking the lake. Park facilities include a boat launch, 32 day use picnic sites and dry toilets. Be sure to take your camera and binoculars and visit the viewpoint. Located just 5 km (3 mi) east off Hwy 97, 34 km (21 mi) north of Dawson Creek, the park offers 28 campsites on the south bank of the Kiskatinaw River. Stroll along the river and see the historic curved wooden trestle bridge built in 1942. The bubbling waters of Liard River Hotsprings are a tempting invitation for travellers to stop and relax at Mile 496 (798 km) of the Alaska Highway, 317 km (197 mi) northwest of Fort Nelson. The natural hot springs result in a unique environment for outdoor enthusiasts. The 668 ha (1650 ac) park offers 53 campsites, a picnic area, playground, and short hiking trail. Reservations are accepted. Located 26 km (16mi) northwest of Chetwynd 3km (2mi) off Highway 29, Moberley Lake Provincial Park is a popular spot for swimming, boating and picnicing. Visitors will enjoy the interpretive nature trail. A playground is provided for youngsters. Set in a spruce forest, the 97 ha (240 acre) park offers 109 campsites and picnic sites. Reservations are accepted. This 32,000 ha (79,040 acre) wilderness park is located about 45 km (28 mi) south of Tumbler Ridge off Highway 29. Facilities include 42 forested campsites, picnic sites, and 22 km (14mi) of hiking trails. Monkman Provincial park is famous for Kinuseo Falls, a breathtaking stretch of the Murray River. Situated on the east side of Muncho Lake on the Alaska Highway, 245 km (152 mi) west of Fort Nelson this 88,416 ha (218,387 ac) park offers two provincial campgrounds with a total of 30 sites on Muncho Lake. Dry toilets. Boat launch & fishing. Reservations are accepted. At Mile 385 (620 km) of the Alaska Highway, where One Fifteen and McDonald Creeks meet, is this handy campground and roadside rest area. The 51 ha (126 ac) park has camping sites for 8 units. A 61ha (151 ac) campground and park located on the southeast shore of One Island Lake 24 km (15 mi) off Highway 2 at Tupper, southeast of Dawson Creek. This crystal clear lake is noted for it�s fishing, and a boat launch is provided. Swimming and watersports are also popular. The facilities include 30 campsites and a picnic area. The Prophet River Recreation Area encompasses 115 ha (284 ac) overlooking the river at Mile 217 (350 km) of the Alaska Highway. Facilities include 45 forested sites. Hike to the river below and try your hand at fishing. Located at Mile 373 (600 km) at the highest point on the Alaska Highway, 139 km (86 mi) west of Fort Nelson, this 25,691 ha (63,457 ac) park offers visitors a chance for an adventure in the Rocky Mountains. Camp at Summit Lake, elevation 1267 metres (4156 ft) and then hike into nearby sub alpine lakes. Take the camera along, you�ll see some breathtaking vistas and wildlife. Be sure to cast a fishing line into Summit Lake. The campground offers 28 sites. One of the first provincial parks to be established in B.C., Swan Lake Provincial park is located near Tupper, southeast of Dawson Creek. The 67 ha (165 ac) park offers 42 campsites located on the lakefront. The kids will enjoy the playground and water sports. A boat launch is provided and fishing is popular. 77 km (48 mi) west of Fort Nelson, at the confluence of Tetsa River and Mill Creek, is the 115 ha (284 ac) Tetsa River Park. The park offers 25 campsites and a chance to fish the river and creek. 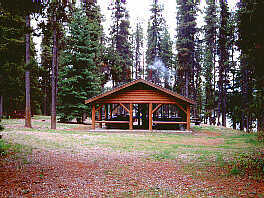 Just north of the community of McLeod Lake, near the junction of Highways 97 and 39, is Tudyah Lake Provincial Park. This 56 ha (138 acre) park includes 36 campsites and picnic sites set on the south end of the lake. Swimming and fishing are popular activities, and a boat launch area is provided. The park is found on a secluded peninsula reaching into historic McLeod Lake. This area was once admired by explorer Simon Fraser who established Fort McLeod in 1805. The park is the perfect base from which to explore the area. It is located 130 kilometres north of Prince George on the Hart Highway #97. The campground is located on the sandy point of the peninsula and features 69 private sites. A nature trail loops through the woods to the campground.